Brundibar's plot is very simple. Pepechek and Hanichka's mother gets sick, and the family has no money to buy milk. Having learned about this, the neighborhood children make a street performance and collect the money. All of a sudden, the evil organ-grinder Brundibar appears and steals the money. Good animals Ц a dog, a cat and a sparrow Ц come to children's rescue, find the thief and return the money back to the children. The triumph of Good is complete. 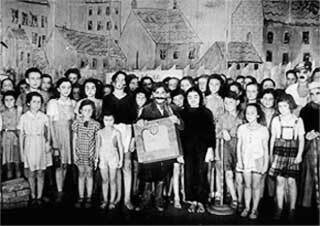 The first performance of Brundibar took place on 23 October, 1943, and became a great event in camp's cultural life. Frantishek Zelenka made scenery, including shields with animals' muzzles. Poking their faces into holes, the children became cats and sparrows. Brundibar was shown 55 times. E.M. 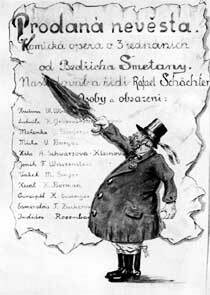 The final scene of the opera Brundibar . Mounted by F.Zelenka.